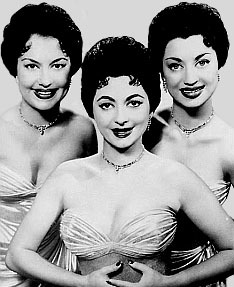 'Starting with the A-B-C of it': Singing, dancing, stage-showy sisters Peggy, Cherie and Babette De Castro spent their formative years in Cuba but were born in different parts of the Western Hemisphere (Peggy, birth name Marguerita, on a Dominican Republic sugar plantation owned by her father in 1921, Cherie in New York City in 1922, Babette in Havana, Cuba in 1925). They broke into the business after permanently moving to the U.S. in the mid-'40s. A cousin, Olgita De Castro Marino, served as a "fill-in sister" from time to time, flawlessly fitting the part. The trio flirted with film stardom in the 1940s and took advantage of the new medium of television a few years later. Then in 1954 a major hit, "Teach Me Tonight," revitalized the multi-faceted act and ensured a long run as successful nightclub performers. Starting out in Cuba while still teenagers, they patterned themselves after America's famous female group The Andrews Sisters and were briefly known as The Marvel Sisters, a name they didn't like. After landing on America's shores with a unique and well-polished act, doors opened easily. Two 78s on Enterprise, a Los Angeles label, were released in the summer of 1946 with backing by saxophonist Jose Madera's orchestra. "Peru," a ballad with English and Spanish lyrics, was backed with "Penicillin Makes You Willin'," an unusual novelty song about the recently-developed "miracle" drug. The next disc contained a pair of uptempo Latin ditties, "Maracas in Caracas" and "Nina From Argentina." That same year the sisters contributed to Walt Disney's live action/animated Song of the South (uncredited "animal voices"); most notably, they're heard backing James "Uncle Remus" Baskett on the Oscar winner for Best Song, "Zip-A-Dee Doo-Dah." The De Castros appeared on a January 1947 TV special marking the inaugural broadcast of KTLA, channel 5 in Los Angeles (the city's first commercial TV station), which featured several stars including Bob Hope in his small screen debut; not many were able to watch as only a few hundred homes in the L.A. area had TV sets at the time. The trio sang "Dark-Eyed Latin Maid" in Over the Santa Fe Trail, then a big break came when they were cast in Copacabana, a 1947 Goldwyn Studios musical comedy starring Groucho Marx and Carmen Miranda; having been inspired by Carmen's vivacious personality in their own stage routines, it was a natural for them to join her (much too briefly) for the film's finale, "Let's Do the Copacabana." Afterwards they appeared in several other feature-length movies and film shorts. A single for London Records, "We're Not Telling," came out in 1950 and credited The Three DeCastro Sisters with the Rumbaleros. Later they performed with "King of Latin Music" Tito Puente and his orchestra at several N.Y. venues and made records with the famed percussionist. "Tonight I Am in Heaven (Usted)" and "I Do (Que Va)" were consecutive releases on George Goldner's Tico label in 1952. 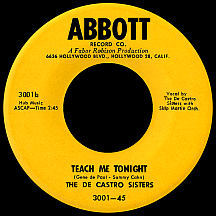 In 1954 Fabor Robison, owner of Abbott Records, spotted the sisters in a nightclub and signed them despite his label's focus on C&W acts (Jim Reeves was his top star until he let RCA Victor get their hooks into him). The A side, "It's Love," was ignored by deejays in favor of the flip side, "Teach Me Tonight," a Gene de Paul-Sammy Cahn song with mildly provocative lyrics ('One thing isn't very clear, my love...should the teacher stand so near, my love?...') that fueled its rapid surge on the charts, where it peaked at number three on Billboard's Best Sellers before Christmas. Competition came from Jo Stafford on the pop side and Dinah Washington, whose version went top ten R&B (it also became Route 66 actor George Maharis's first and biggest hit when he embarked on a singing career in 1962). The Latin flavor of their music became much less obvious at this point. Orchestra leader Skip Martin regularly worked with the De Castros on their Abbott recordings, but a hit follow-up wasn't immediately forthcoming; the plaintive "I'm Bewildered" ('...I'm perplexed!') missed the charts altogether. "Boom Boom Boomerang" was written by Lonnie Coleman, a country music singer and songwriter from Georgia who recorded for Robison's Fabor label. The track featured a bass vocal by Thurl Ravenscroft (the voice of Tony the Tiger of Kellogg's Sugar Frosted Flakes fame) and reached the top 30 in May 1955. The trio had ten singles on Abbott; "Too Late Now" and the seasonal "Snowbound For Christmas" both reached the charts in December. Many TV appearances and a regular slate of live shows kept the sisters extremely busy through the rest of the decade. Cousin Olgita spent more and more time as a replacement for Peggy, who occasionally performed solo or with a group she'd assembled. In the fall of '56, with Peggy back in tow, they signed with RCA Victor. "It's Yours," an unexceptional Charles Tobias-Arthur Altman ballad, was the only charting single during a little over a year with the label; "Flowers on a Hillside" (penned by Rod McKuen) and "What A Relief (Hoop Ah Hoop Ah, Bah Dah Dah)" (a bouncy Beverly Ross-Lee Morris tune) were stronger efforts. More motion picture work materialized including appearances in Rhythms With Rusty, a 1956 Universal film short starring Rusty Draper, and The Helen Morgan Story in '57. A mid-'58 move to ABC-Paramount Records commenced with "Who Are They to Say" (a de Paul-Cahn song that wasn't effective at rekindling the magic of "Teach Me"), followed by a move so many have made, so often misguided...but this time it worked. 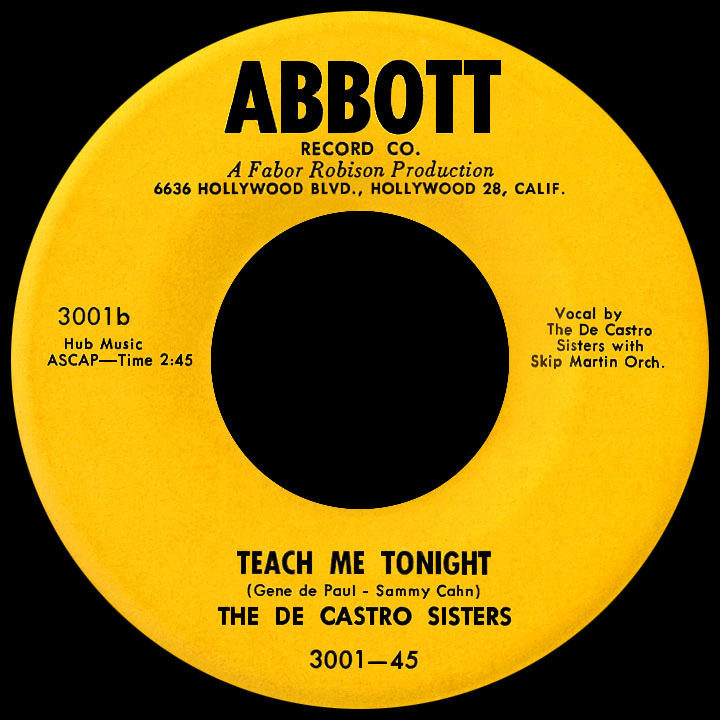 'Right down to the X-Y-Z of it': "Teach Me Tonight Cha Cha" was reworked in the style of 1959's big dance craze, recharging the De Castros' signature song of more than four years earlier...the catch being the twice-a-hit tune would always have an overshadowing effect on their career...not such a bad thing, since many others have sought to capitalize on a specific recording in order to retain a measure of fame well past a typical expiration date. Their record-making phase was on the skids by the time The De Castro Sisters joined Capitol Records for a short stay in 1960. But the stage antics continued for many years, particularly on the casino circuit. Babette passed away in 1991, at which time Olgita stepped up to "permanent sister" status as the trio performed regularly throughout the '90s. Olgita died in 2000, then Peggy in 2004. Cherie carried the torch afterwards as a solo act, appearing mainly in Las Vegas where she lived until her death in 2010.